I'm going to start a "best picks" list. This is #1! One day, she picked up her old Bible, dusted it off, and began to read. Somewhere in the middle, God opened her hardened heart to see that He was real, that He still loved her, and that He had a purpose for her life, if she's only give her heart to Him completely. 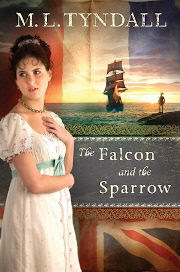 I think I'd call this book a cross between The Scarlet Pimpernel and Lori Wick's The Hawk and the Jewel. Of course you know that the lady will get her man in the end, but the author did a really good job of keeping you in suspense the whole time so that you just didn't know how it would happen. I had a hard time putting it down until I was finished! There were a few places where some of the details were slightly implausible, but I suppose that's literary license (you know all that stuff in movies isn't plausible either, right? :) Overall, this may be one book I don't give away, but add to my collection!